Welcome to Enchanted Forest portraits by Reminisce Photography, where the magic begins and painterly fairy photos are created. 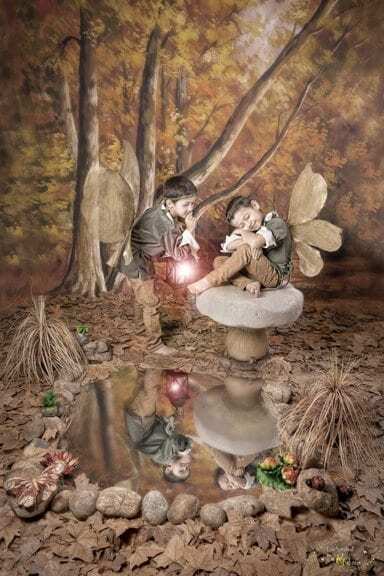 Our award-winning fine art fairy photo sessions are full of magic and wonder. This webpage should be able to answer all of your questions about our fairy photo sessions. Our studio is based in Gawler SA, on the edge of the Barossa Valley, about a 40 minute drive from Adelaide. We also travel to Sydney, NSW and Ballarat, VIC all enquires welcome for the next fairy portrait dates. If you have any questions we would be happy to answer you via telephone, email or via our facebook page. An Enchanted Forest fairy portrait session is unlike any other photo shoot. Clients often tell me their children talk about their fairy photos for weeks after the experience. Our settings are all real, not green screened. Your little fairies can discover the magic right before their eyes, as you watch the magic unfold. Why not join in the fun and create a beautiful parent and child fine art fairy portrait, that will become a treasured family heirloom. We often have Mothers, Aunties, Grandmothers and even the occasional Dad join in the enchantment of a fairy photo shoot. The creation fee includes the session and $100 credit towards your portrait order. A fairy photo session takes around 30-45 minutes. The perfect amount of time for the attention span of children. The captured images are then art worked to create the beautiful painterly portraits we are known for. Brothers and sisters are welcome to be involved in the same session. We request that extended family such as cousins book a separate session to allow us the time needed to create a magical experience. 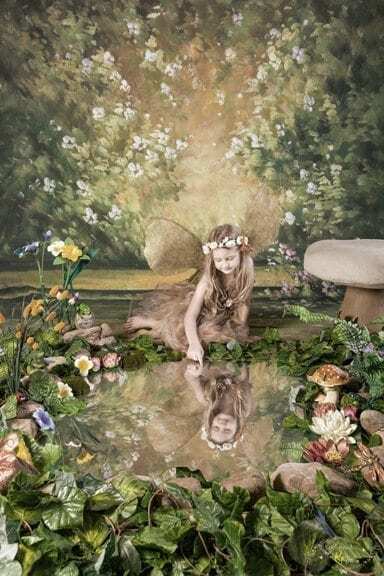 If you would like to have some fairy photographs captured with cousins or friends book the session times one after the other and we will happily capture these at the end of one session and the start of the next. There is no age limit in the Enchanted Forest. We have photographed newborn to grandparents. Most poses are achieved through play, although it is helpful if your child can follow instructions. If your child has a disability that could impact our ability to capture your child during a short portrait session. Or needs a bit more time warming up please let us know so we can help you to get the most out of your time in your fairy photo session. All sessions start in the dressing room, where we transform your child into a gorgeous fairy. Girls can choose between a pink & purple or an autumn coloured hand made romantic tutu dress. Boys costumes are styled from Peter Pan and they can decide if they would like to wear wings or not, although I always recommend wings. Our wings are handmade of golden fibers and complete the fairy experience. We have a range of fairy crowns to finish it off. We recommend hair to be left down and slightly pinned back if necessary. Make up is not required. Please remove all fake tattoos and bright or dark coloured nail polish prior to your session. Underware for girls should be light in colour (not red or dark blue/black) and not boy leg styles. Exclusive to Reminisce Photography Enchanted Forest fairy art portrait sessions are produced to the highest quality. Our sessions often book out so book early to avoid disappointment. We currently offer four complete settings in our Gawler studio, which we rotate throughout the year. When traveling interstate we carry the forest glade, moonlight and spring blossom, your session starts with the selection of setting. Portraits are available to purchase either by an in person appointment, our preferred method, as you can view the portraits at a larger size on our flat screen. You will be able to select your fairy photograph included in the creation fee at this time. If you’re not in SA we create a password protected album on our website, any orders can be placed directly through the site. Don’t forget to enter your code when ordering your fairy portrait included in the creation fee. Portraits are available to purchase starting from $100. We find most people fall in love and can’t resist spending more on art work for their home. All ordered portraits take approximately four weeks to complete. For a full copy of our products available click the link below and request our rate card. If you’d like to be kept updated on our next Enchanted Forest Portrait sessions contact us through the link below and let us know where you are. Sessions now open for booking in our Gawler studio and our next Sydney trip in April, call Naomi to book your session today. We have all the costumes, wings and props, you bring the magic, if you listen closely you can almost hear the whispers in the forest. Fine art fairy portrait sessions a truly magical experience for your little fairy prince or princess. Come along and tiptoe through the Forest. Request a rate card here.